Introduction: Battle Ropes were once relegated to the world of Crossfit. However, in recent years, they have broken through the fiber of the mainstream world as one of the most effective dynamic workout tools out there. Battle Ropes were first introduced to the world by John Brookfield. They work on the principle of generating a dual force that combines the force of gravity to produce a full-body physiological impact. As a result, an individual develops a better grip and exercises the muscles on their core, knees, ankles, hips, feet, shoulders, biceps, and triceps. Basically, it’s one of the most effective full-body workouts that also happens to burn a lot of calories. Due to the dynamic nature of these exercises, they’re a great supplement to your regular cardio or weight training programs. However, not all battle ropes are built the same. Some are more beneficial than the others. If you’re going to invest so much time and energy on battle ropes, you need to ensure that you at least have the right product. Choosing the right battle rope is especially difficult for novices because there are so many different categories, types, lengths, and brands to consider. However, in this article, we’ll give you a detailed overview of the 5 best battle ropes in the market. To compile this list, our in-house fitness team has personally vetted some of the most popular battle ropes on the market. We’ve also consulted with some of the leading Crossfit instructors and physiotherapists in the area. The POWER GUIDANCE Battle Rope is available in a range of different size combinations — 1.5” x 30’/40’/50’ and 2” x 30’/40’/50’. 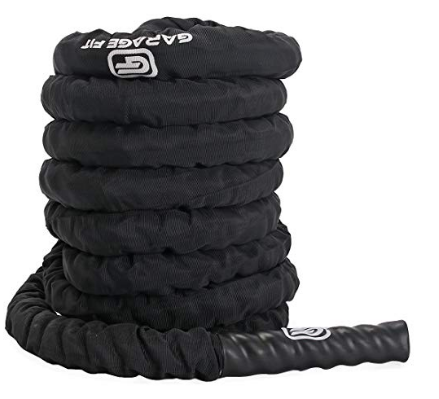 It’s made of Poly Dacron material — which is the best material for Battle Ropes — and it’s covered with a nylon sleeve to enhance its durability and render it waterproof. The nylon sleeve will also keep your home or gym clean because the fraying strands won’t fall off. Furthermore, no dust or water can permeate the nylon skin, preventing the 3-strand twisted rope from gaining additional mass. One of the best aspects of this battle rope is that it comes with a complementary anchor. As such, you don’t need to shell out additional cash on an anchor or find poles to tie the ropes around. 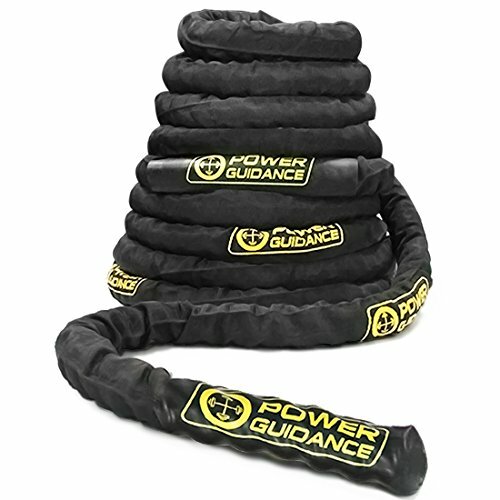 Power Guidance also happens to be one of the most reputable brands when it comes to battle ropes. Appropriately, it’s also more expensive than its competitors. Available in two size combinations — 1.5” x 30’/40’/50’ and 2” x 30’/40’/50’. 10 inches heat shrink grips. All range of sizes are available. 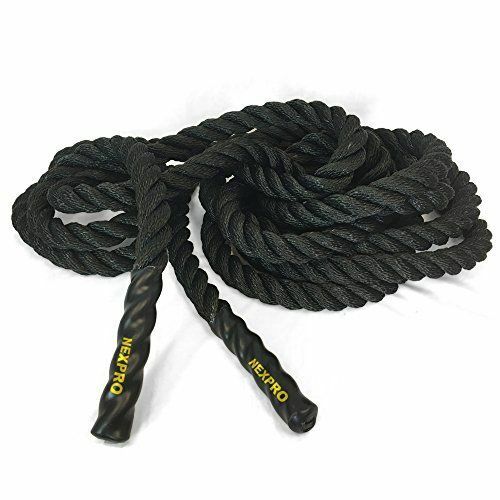 The POWER GUIDANCE Battle Rope is the best Poly Dacron battle rope in the market as it’s highly durable, comes in various sizes, is covered in nylon, and comes with an anchor! NEXPro Battle Rope is an extremely strong and durable battle rope with some great features. This battle rope has been constructed from a blend of polypropylene and polyester materials, which is one of the most durable materials out there. The polypropylene maintains a lightweight while providing high strength, and the polyester helps prevent the splitting of fibers. Together, they provide brilliant resistance. The end of the rope also comes with heat shrink caps to prevent wear and tear. 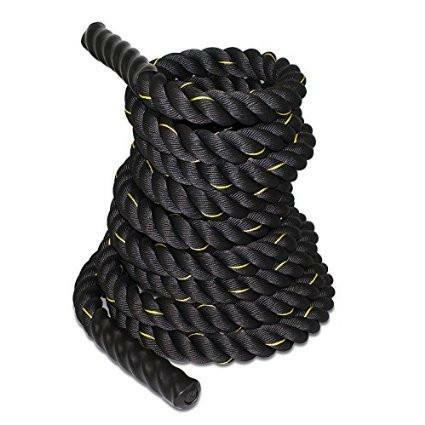 This battle rope is only available in a 1.5” thickness, and it’s available in the following lengths — 30’, 40’, and 50’. The ropes weigh 18 pounds, 23 pounds, and 27 pounds respectively. The entire length of the ropes are also covered in 600D Oxford Waterproof Sleeve to enhance the durability and prevent water damage. Available in one size — 1.5” x 30’/40’/50’. Some customers state that it started fraying quickly. Only available in 1.5” diameter. Anchor has to be bought separately. The NEXPro Battle Rope is another highly durable and strong battle rope that’s also cost-effective. ZENY is an extremely well-reputed brand when it comes to fitness products. Their battle ropes quickly enhance your muscle endurance while also working your cardiovascular strength. It also happens to be aesthetically pleasing with yellow/orange track lines running along the black ropes. These battle ropes can withstand the harshest of abuse. It’s available in 2 size combinations — 1.5” x 30’/40’/50’ and 2” x 30’/40’/50’. The material used is 100% Poly Dacron with a 3-Strand Twisted design. The enhances the durability of the rope while also increasing its potential to provide full-body conditioning. The ends of the ropes are covered in heat shrink caps to prevent wearing away, and the whole rope is wrapped in a 600D Oxford Waterproof Sleeve. As such, it’s water and dirt proof and can withstand being slammed on the ground repeatedly. Some of the customers complain that the 40 feet rope is actually just 37 feet in length. Complaints have been made about its stiffness. The ZENY Black Battle Rope is one of the most cost-effective battle ropes in the market. However, it’s still extremely durable, strong, and made of the finest material. The Titan Fitness Battle Rope is one of the most popular battle ropes in the world, but it’s largely meant for experience lifters because it’s only available in a 2” thickness. The 2” battle rope is available in three lengths — 30’, 40’, and 50’, the latter of which weighs 47 pounds. The rope is made of a Poly Dacron blend. It’s not 100% Poly Dacron, however, it’s still resilient and has a high tensile strength. The handles of the rope are made of heavy-duty materials and the rope is waterproof. Furthermore, even though it’s not covered in nylon, it still doesn’t leave fibers on the floor. Available in 2” thickness in the following lengths — 30’/40’/50’. Only meant for skilled users. It’s not 100% Poly Dacron and starts fraying soon. Doesn’t have a nylon cover. 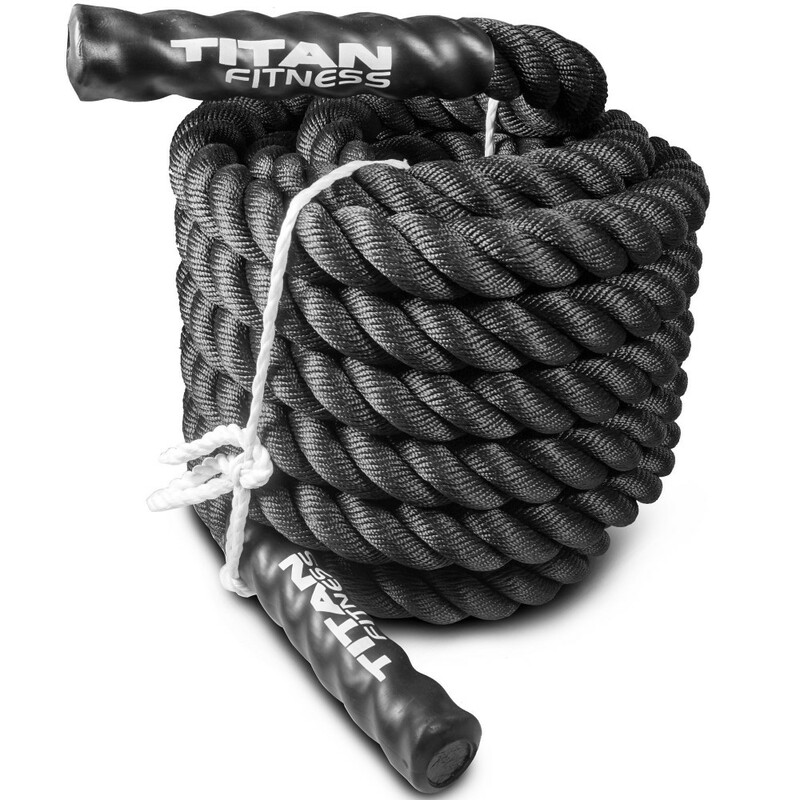 The Titan Fitness Battle Rope is one of the most durable and powerful ropes out there, but with a 2” thickness, it’s only meant for advanced users. These garage Fit Battle Ropes come in two size combinations — 1.5” x 30’/40’/50’ and 2” x 30’/40’/50’, and they’re made of 100% Poly Dacron and covered in a nylon sleeve. The 3-strand design leaves it wear-resistant and durable, and the nylon sleeve renders it water and dirt resistant. Furthermore, the heat shrink caps also provide great grip. Available in different color combinations — Red, Blue, and Yellow. Garage Fit Battle Ropes are durable and strong battle ropes available in various sizes for people in different intensive training levels. However, they have a weak grip which makes them slightly annoying to use in the long run. In this part of the article, we’ll give you all the information you need about training with battle ropes and how to go about selecting the right one. Battle Ropes function on the basis of the dual-force dynamic effect created as a result of the force generated by the rope’s waves against the force of gravity. As a result of this amplified dual-force, your body’s physiological responses are greatly enhanced. Most weighted exercises and even cardio workouts use the force to gravity to enhance their muscles and work their body. A battle rope adds to that by also generating force based on the rope’s waves, thus amplifying the force of gravity. Since you are limited by the force generated with your own efforts, the potential for injuries due to overexertion is minimized. Even though the potential for injuries is drastically reduced, they still get you better gains because the force produced is explosive and dynamic. Furthermore, since the force is created by the user’s body, there’s no need to constantly increase the resistance, the force will simply continue being amplified as your body grows stronger. Battle Ropes can work multiple muscle groups including the shoulders, core, knees, feet, and hips. The shoulders remain in a “packed” position when you generate the rope waves. This helps work the shoulder muscles, and the impact is only amplified as you get stronger. The core is strengthened as a result of being stabilized and the series of rotations you have to go through to alternate the waves. The hips, feet, and knees are strengthened because they are work with gravity to enhance the output produced by the torso. Regardless of how you’re using the battle ropes — lifting, pulling, waving, etc — it forces your body to remain stable. These repetitive movements enhance your stability and core strength. You should practice the following tips to really boost up your performance. On the outset, it seems like the upper body is engaged in doing all the work as it generates the waves. However, it’s necessary to properly ground yourself and stabilize your legs and hips in order to generate even more force while also working your legs and hips. Holding your breath while working the ropes is not advisable, yet it’s all too common. Instead, you should focus on maintaining a steady breath. Battle ropes require endurance, longevity, and focus. As such, you need to practice breathing through the motions instead of holding them in, which will impede your ability to get through the workout. Interestingly enough, you can’t work the battle ropes well if you hold them firmly and tense your whole body. As opposed to most exercises, you need to remain limber, hold them casually, and start making waves! There are a number of exercises and workouts you can do using the battle ropes. Some of them are used for targeting specific muscle groups and some can be used as a full-body work out and conditioning. The following are some of the most effective battle rope workout routines. Hold one end of the rope in each hand and stand with your feet shoulder-width apart to create a stable base. Now squat down slightly while maintaining a neutral spine. Now start creating a wave pattern with the ropes with alternating hands. If you’ve mastered the alternating waves, it’s time to up the ante. This time, as you alternate the waves, also take a lunge with the alternate leg. Doing so will simultaneously work your legs even more. Squat down with one end of the rope on each arm and your feet shoulder-width apart. Lift both ends of the rope simultaneously and slam them down on the ground with as much force as you can muster, and then repeat it as fast as you can. Grab one rope in each hand and jump up with your hands over your head. Mimic the jumping jack movements while holding on to and creating waves with the ropes. Squat down slightly and stand with your feet shoulder-width apart. Grasp a rope on each hand with the palm facing down, lift your arms over your shoulders, and start making circular patterns with the ropes on each arm. Stand in the position of the Alternating Waves. However, in this case, instead of making the ropes go up and down, make them go left to right. Move your arms towards each other and then back out again. The ropes will mimic the pattern of slithering snakes. Which part of the body does a battle rope exercise? Most battle rope exercises provide an exhaustive work out for the whole body, hitting each of the muscle groups powerfully. However, in some exercises, the upper body and core are hit with a stronger force than the legs and hips. If done correctly, you can use battle ropes to provide a full body workout for the torso, back, glutes, and abs. How to Anchor a Battle Rope? When you’re using battle ropes, you are holding on to one end and the other end needs to be secured in place. As such, you can tie the rope around a tree or a pole. You can even tie it around a strong kettlebell or dumbbell, anything firm that can secure it. In lieu of all else, you can even get someone to hold one end of the ropes for you. How close to the anchor do the Battle Ropes need to be held? The closer you are to the anchor point, the stronger will be the force generated. As such, if you’re a novice, you can stand as far back as possible. But if you want a challenge, get close to the anchor point. However, if you’re exercising close to the anchor, you should take routine breaks to also exercise from far to cool down and prevent overexertion. What is the recommended length of time for a Battle Rope workout? Overexertion is a very real thing, especially when you’re using as intensive an exercise tool as battle ropes. Overworking your muscles can lead to your body using reserve energy from your immune system to repair your tissues, thus leading to illnesses and injuries. As such, you should not exceed your personal limit when it comes to battle rope training. While the specific burnout limit varies for different people, experts recommend that a 10-minute battle rope session is more than enough for an intense workout. How many Calories does a single Battle Rope session burn? The amount of calories your body burns depends on various factors. For example, lean muscle burns more calories than fats. However, on an average, a single 10-minute session of battle ropes should burn approximately 110 calories, according to The Journal of Strength and Conditioning. Do Battle Ropes get Wet? Most battle ropes come with a waterproof nylon sleeve so they don’t get wet. In the case of non-waterproof ropes, they can get wet. However, that’s not much of an issue if you dry them off. If you allow the water to soak into the fibers, they’ll become considerably heavier, making the workouts even more difficult. Can Battle Ropes be Combined with Weights? You can absolutely supplement weight training with your battle rope sessions. The two will complement each other and you’ll be able to specifically target muscle groups and supercharge them with the combined strength of the battle ropes and the weight exercises. When you’re buying a battle rope, you need to take the following factors into consideration. Most battle ropes are made of Poly Dacron or Manila. In this case, priority must always be given to Poly Dacron, which is a made of Dacron plastic fibers and polypropylene. These ropes have been constructed out of twisted strands and they’re far more durable than manila and don’t shed their fibers with use. When you purchase a rope of a certain length, you have to split it in half and use it for both arms. As such, a 30 feet rope will mean you’re holding 15 feet in both arms. The longer the rope, the more fluid will be the motions. As such, if you want fluidity of motion, go for long ropes. However, if you want to challenge yourself, you can get a shorter rope that will require more strength to work with. A 50 feet rope is a popular choice. The thicker the rope, the more difficult the exercise. A popular choice for thickness is a 1.5-inches thick battle rope. A rope with a 2-inch thickness is considered too difficult even by pros. Battle ropes take on a lot of abuse as you’re constantly waving them and slamming them on the ground. As such, you should choose battle ropes that are encased in a 600D oxford or nylon waterproof sleeve. It will act as a protective layer that will keep the ropes from getting wet and absorb most of the impact. You need a rope with a fluidity of motion as you’ll be using them for a number of exercises. Battle ropes get more flexible with use. However, some remain stiff. As such, before purchasing it, read its comments and make sure that it’s flexible enough. Battle Ropes are one of the most effective and exhausting workout tools out there. They provide you a complete body workout that hits every major muscle group and also burns a lot of calories. As such, it’s a great workout program for those who are trying to simultaneously lose weight and gain lean muscle mass. However, you have to be careful while using battle ropes and make sure that you have the right ones for the job. Using poor form or the wrong ropes will simply kill your gains. In this article, we provided you with the 5 best battle ropes in the market and also gave you a detailed buyer’s guide to help you select the best one for your specific needs. If you have any other questions about battle ropes, feel free to mention them down in the comments section.